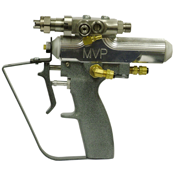 Magnum Venus Plastech’s Pro Gun has been a staple of the MVP Product Line for nearly 10 years. Distributive Mixing: During operation, catalyst is injected into the center of the gun’s mix chamber while resin is forced into the chamber through several surrounding the catalyst port. This unique concentric pattern creates a balanced flow, and blends materials efficiently and thoroughly. Distributive Mixing actually pre-mixes catalyst and resin before they pass through the turbulent mixing device. The results are significant material savings, improved quality control and reduced styrene fuming for a clean, safe work environment. Air-actuated Trigger: The Pro Gun’s trigger operates in two positions. Pulling the trigger gently toward the operator opens an air valve to spray catalyzed resin alone. Additional force moves the trigger into its second position to activate the chopper and spray glass. Because it is highly responsive to even light force, the trigger provides the operator with enough control to spray parts of complex shape and small size. Advanced Rotary Valve: The Pro Gun replaces manually adjusted trigger needles with a stainless steel rotary rod that maintains consistent volumes of resin and catalyst. Built into the gun block, the rod turns during operation to expose two holes cut in the center. Resin and catalyst then flow simultaneously through the holes and into the distribution ring. Versatility: Modular construction enhances the Pro Gun’s versatility, and simplifies disassembly for cleaning and maintenance. The removable mix housing allows rebuilding a “set-up” gun in minutes. The gun’s push-button flush system is also easy on the operator. Material flows directly through the resin port to the mix chamber during flushing, leaving no residual resin to get in “dead” spots. The Pro Gun is compatible with all M.V.P. internal mix units.